SHIPPING SPECIAL, around $119 shipping, curb side delivery, (more details), to most locations! Bench crafted with quality materials by hard working Americans in a small family owned factory the old fashioned way. We offer our 48 inch mattresses in two different lengths, so please select the length that will suit you the best from the drop down menu above. Our SUPREME mattress is a super pillow-top/firm model. Designed around a 14.5-gauge coil lura-flex spring set that offers over twice as many individually wrapped coils compared to our GOOD, BETTER, and BEST models. Beginning with molded spring protection on both sides of the coils, a cotton pad, and a layer of bonded cotton follow. The needle-punched cotton pad lies under a .5-inch layer of comfort foam, which is topped with a .75-inch layer of heavy density foam. 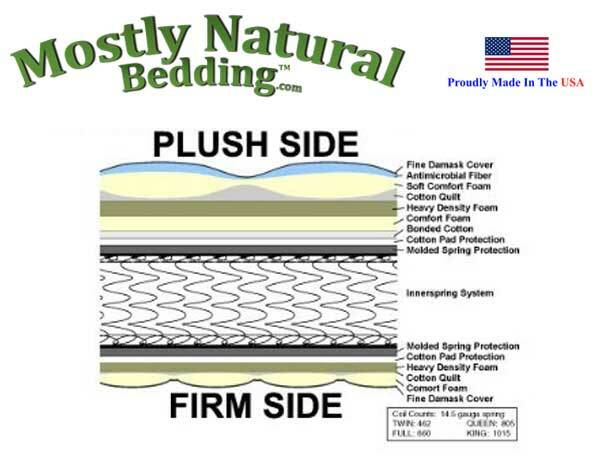 Next the pillow-top is created from a layer of quilted cotton and a 1.5-inch layer of super soft comfort foam topped with a 2-inch layer of antimicrobial fiber. Finally the fine damask cover is quilted to create a supreme pillow-top/firm mattress. This SUPREME mattress incorporates our amazing plush pillow-top on one side and firmer mattress non pillow-top on the other side. Want a different feel? Just flip the mattress. An idea whose time has come, especially when you consider the poor value that a one sided "no flip" mattress offers. Our SUPREME model sold here offers low price with plush pillow-top but supportive feel and a firmer feel with tighter quilting on the other side. The outer fabric is a long wearing high quality damask. 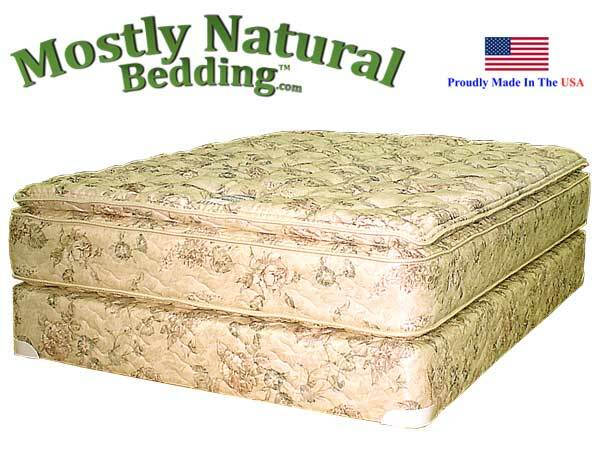 The high quality padding and cushioning of the mattress are described in the cutaway section available in additional images for this product. The metal frame is not included but available. See below for frame choices. This Mattress set meets or exceeds the flammability standard FF4-72. 48 inch x 75 inch Size Mattress has approx. 600 Coils. 48 inch x 72 inch Size Mattress has approx. 560 coils. NOTE: This is a special-order item. Please call us with any questions you have prior to ordering 740-593-5000. WARRANTY AND RETURNS: This mattress or mattress set is custom made so it is not returnable for any reason. Orders cannot be canceled or changed once production has begun. Our mattress and/or Mattress and Foundation set will last for years. It is built from top quality componets and does not rely upon soft and cheap padding that can imprint and indent over a short period of time. However, we do not warranty our bed because we ship it all over the country and it is cost prohibitive to do a return. With proper metal frame support and proper foundation support (if you buy a set you get an excellent foundation) the mattress will last for years. Forty-eight inch Abe Feller® SUPREME available as a mattress set.